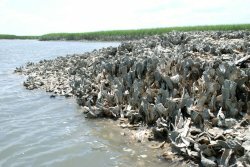 Oyster reefs are on the decline, with over-harvesting and pollution reducing some stocks as much as 98 percent over the last two centuries. With a growing awareness of oysters' critical roles filtering water, preventing erosion, guarding coasts from storm damage, and providing habitat for other organisms, researchers have been investigating how oyster reefs form in order to better understand the organisms and offer potential guidance to oyster re-introduction projects. At the same time, researchers have been studying marine animals' various adhesives, uncovering fundamental properties that could yield new innovations from replacements for medical sutures to surface coatings that keep waterborne craft from picking up marine hitchhikers. Now, researchers from Purdue University and the University of South Carolina have shown that oysters produce a unique adhesive material for affixing themselves to each other, a cement that differs from the glues used by other marine organisms. "We wanted to learn how oysters attach themselves to surfaces, and each other, when building reef structures," said Purdue University chemist Jonathan Wilker, one of the lead researchers on the study. "Such knowledge can help us develop biomedical materials including wet setting surgical adhesives. These insights may also help us prevent marine bioadhesion for keeping ship hulls clean, thereby reducing drag, fuel consumption, and carbon emissions." Wilker and his colleagues studied the common Eastern oyster, Crassostrea virginica, which the researchers collected from the Baruch Marine Field Laboratory on the South Carolina coast. By comparing the oyster shells (inside and out) with the material connecting oyster to oyster, the researchers were able to determine the chemical composition of the cementing material. "Our results indicate that there is a chemically distinct adhesive material holding the oysters together," said Wilker. "The cement contains significantly more protein than the shell. We also observed both iron and highly oxidized, cross-linked proteins, which may play a role in curing the material." Cross-linked proteins are an emerging theme in the study of marine biological materials, central to the glues of mussels, barnacles, and now, oysters. However, the oysters use far less protein in their adhesive when compared to the analogous materials from mussels and barnacles. Beyond this relatively minor protein component, the oyster adhesive appears to be unique, composed largely of chalky calcium carbonate. Oysters seem to prefer an adhesive that is more like a hard, inorganic cement versus the softer, organic glues of other organisms. This research was supported by the National Science Foundation through the Chemistry of Life Processes program under grant CHE-0952928 and the Office of Naval Research through their Biofouling Control Coatings research program. "This is exactly the kind of interdisciplinary, cutting-edge research that we strive to support, particularly by looking at research that lies outside the traditional sub-disciplines in the field," said Dan Rabinovich, the program officer in the NSF Division of Chemistry who supports Wilker's grant. "This is in agreement with the Division's realigned programs, which no longer bear the traditional 'organic', 'inorganic', 'physical' or 'analytical' descriptors in their names." The researchers next hope to determine the interplay between the cement's organic and inorganic components. Then, the chemists will use what they learn to create new classes of synthetic materials as well as adhesion-preventing surfaces. "By understanding how various marine organisms attach themselves to surfaces, it may be possible to rationally design coatings to inhibit this process without the use of toxic components," said Linda Chrisey, a program officer in the Naval Biosciences and Biocentric Technology program who helps fund the research. "This is one of the goals of the Office of Naval Research's Biofouling-Control Coatings research program."